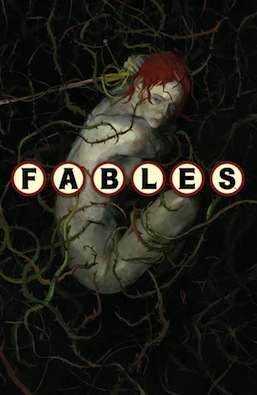 In this post, from Image Comics: Saga #18 and from Vertigo: Fables #137. Yup, just two. It’s a very itty bitty week for comics. 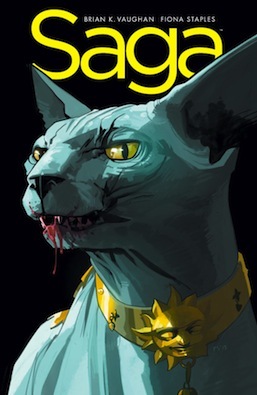 Holy Lying Cat, Batman, this is one action packed issue of Saga! The story picks up right where issue 17 left off, on Quietus in the home of A Night Time Smoke author D. Oswald Heist. Unfortunately, things have gotten messy as not only has Prince Robot IV arrived to capture the star-crossed lovers for betraying the war effort and their people, but Marko’s ex-fiance Gwendolyn and the freelance killer The Will have also made their way to Quietus. You know, where Marko is in hiding along with his sassy mother, baby Hazel and her disembodied ghost baby-sitter Izabel. It’s basically a mess. A glorious mess. In the hands of a lesser author this would be incredible confusing, but Brian K. Vaughan manages to keep hold of all the threads of his story. We get some of Lying Cat’s tragic back story, Gwendolyn and Marko have a heart to heart and she lays all her feelings bare, The Will is just a mess, Prince Robot IV slightly less so but still not doing so hot and Marko proves just how much he believes in his wife Alana. Also featuring another appearance by fellow freelancer The Brand and a TIME JUMP OF ADORABLE! Yes, that needed to be in all caps. Issue 19 now please! This is the final issue in the “Camelot” arc, which is narrated by one of Bigby and Snow’s children (it’s a surprise, you have to find out which one yourself) who has the amazingly impressive ability to experience all events occurring at one point in time simultaneously. For instance, she can be making deals with Santa, talking to her mother, securing her role as the North Wind, checking on Therese’s charges in Toyland and watching over her Aunt Rose all at the same time. It is through her that this wonderful issue is narrated and it was a really smart move to show the various threads of the story through her eyes. Good job Bill Willingham! Unfortunately, Snow and Rose have had a falling out (as seen in prior issues) and Snow is spending her time trying to be strong for her kids in spite of the pain she must be feeling. As her daughter notes, “No one in all the many world is stronger than Mommy. I know, because I checked.” Meanwhile, Rose is re-forming the Knights of the Round Table and re-enacting the King Arthur myth with herself in the role of Arthur. Not only is Rose another strong female figure — in a completely different way from her sister — but she’s also stronger than the legendary King Arthur who was after all just a human man. Rose on the other hand is, “..So much more. More than human. More than even Fable.” Honestly, I still don’t know where this storyline is going and I love it.